and Swimming on Beautiful Lake LBJ! This beautiful waterfront lake house is located on open waterfront on the popular Colorado Arm of Lake LBJ in Kingsland, Texas. It has 3 bedrooms, 2 baths and can comfortably sleep up to 10 people. 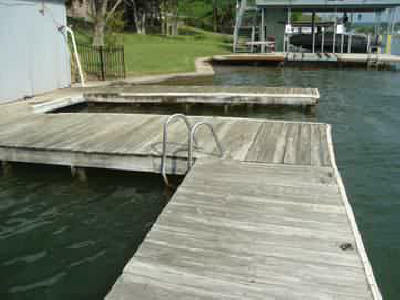 Fish, swim and boat from the fishing/swimming dock and park your boat in the boat stall for quick and easy access to Lake LBJ. You will love watching the moonlight reflect off the water at night and the sunshine sparkle on the water during the day. Moonlight on the Colorado Lake House is located in central Texas only one hour northwest of Austin, 90 minutes north of San Antonio, 3 1/2 hours south of Dallas/Ft. Worth and 4 hours west of Houston. Moonlight on the Colorado is a fully furnished lake house on Lake LBJ that is for rent for periods of one month or longer only. You will love it! 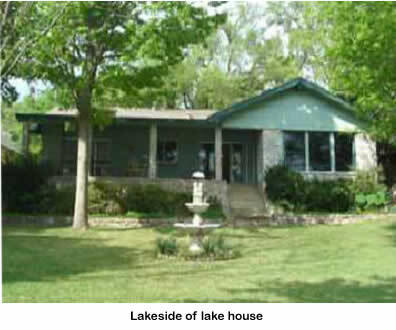 Enjoy the lakefront life style in this nice lake house on beautiful Lake LBJ. Lake LBJ is famous for being one of the largest, normally constant-level lakes in the U.S. You will find the best conditions for boating, water-skiing, jet-skiing and swimming on Lake LBJ. From this location you can boat up the Colorado River, down Lake LBJ all the way to Horseshoe Bay 20 miles away, and up the Llano River, exploring coves and looking at beautiful waterfront homes on the way. 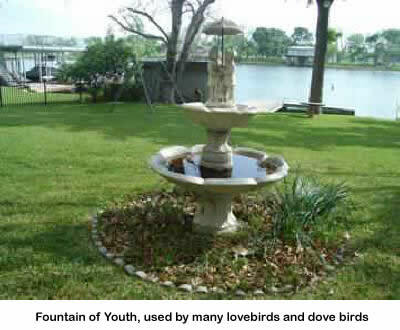 Enjoy the gentle lake breezes while sitting on the porch and watching the boats and water-skiers go by. 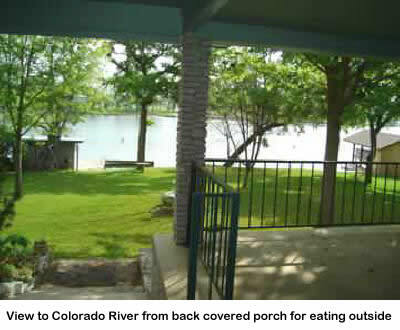 The porch is a popular gathering place for meals, relaxing and watching the moonlight reflection on the Colorado. There is plenty of seating for everyone. This lake house was designed for maximum enjoyment of the lake. It has large windows with great views of the lake from the living room, dining room, kitchen and master bedroom. Sliding doors go from the dining room and master bedroom to the large covered porch. Tie up your boats and jet skis at the boat dock and be out on the lake in seconds. If you don't have a boat or personal watercraft and other water toys, they can be rented locally. Fishing is great from the pier. The pier is also popular place for swimming and sunbathing. From the moment you enter the courtyard with the covered tile entry, you will notice that this special lake house has much to offer. The extra large living room has plenty of space and seating for everyone with 2 sofas and 4 chairs. The 2 sofas can sleep one person each. The raised ceiling, built in wooden shelving, and the large, attractive stone fireplace all add to the ambience of this spacious room. A large picture window at one end of the room provides a beautiful view of the lake. Gather around the baby grand piano or the organ for an evening of singing your favorite songs with family and friends. The 42 inch Flat Screen LCD HD TV is in the living room. The TV makes the living room like a theater. The living room also has a DVD player, a VCR, and a stereo and CD player. The home also has Wi-Fi Internet access and a computer station with a printer. The dining table seats six people and has a nice view of the lake through the sliding glass doors. The buffet adds extra space for serving meals. The kitchen has everything you need for preparing your meals and snacks while at the lake. It has a dishwasher, refrigerator, stove with oven, microwave, coffee pot, can opener, dishes, dinnerware, pots and pans, etc. All you need to bring are your food and drinks. 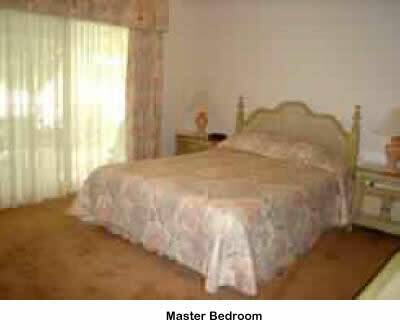 The master bedroom has a queen-sized bed, a love seat, dresser, chest of drawers, 2 night stands, and a TV. 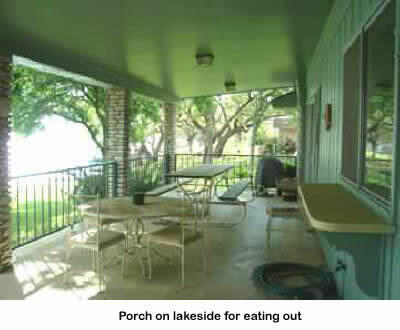 Sliding glass doors provide a great view of the lake and access to the covered porch. The master bath has 2 separate sinks and a tub/shower combination. 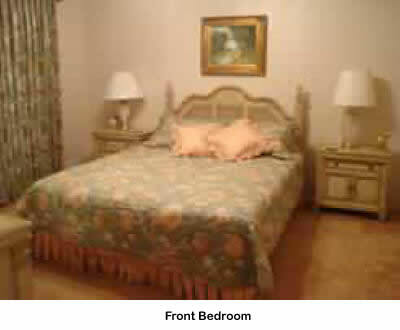 The second and third bedrooms both have queen-size beds and dressers. A second bathroom with a tub/shower combination is down the hall from the second bedroom. The utility room has a washer and dryer for your convenience. There is also a sink and a set of bunk beds. Lake LBJ is a normally constant level lake for the best conditions for water activities. 3 queen-sized beds, 2 queen-sized sleeper sofas, and 2 bunk beds for sleeping for 10 people. Boat dock for tying up boats and jet skis. Great views of the lake from the covered porch, living room, dining room, kitchen and master bedroom. Lakeside wing to relax in and enjoy the cool shade in the daytime with big shade trees and the reflection of the moonlight on the Colorado River in the nighttime. Picnic table and table and chairs on the large, lakeside covered back porch for great outdoor meals and conversation. Wi-Fi Internet access and computer station with printer. Fully furnished and fully equipped with everything needed for relaxed lakeside living. Just bring your personal items, food, drinks, and beach towels. Only an hour northwest of Austin, 90 minutes north of San Antonio, 3 1/2 hours south of Dallas/Ft. Worth, and 4 hours west of Houston. Families, children, pets and horses welcome. And enjoy the stars that come out at night.